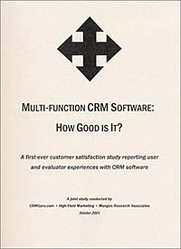 ﻿ Деловая литература : Multi-function CRM Software: How good is it? Главная Каталог Деловая литература Multi-function CRM Software: How good is it? 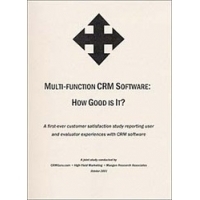 Multi-function CRM Software: How good is it? Siebel is not the CRM software industry customer satisfaction leader. CRM systems by ERP vendors Oracle and SAP may be causing more problems than they solve. CRM software customers want simpler systems-but not at the cost of reducing adaptation that provides the functionality they need. Sales and marketing appear more responsible for market share than system performance. CRM vendors aren't listening to CRM customers. Be alert to problem areas with CRM software. Separate fact from fiction in vendor sales presentations. Get the system you need, not what software vendors want to sell you. If you're selecting CRM software, this study with over 100 pages of valuable information can help you avoid the huge financial and human resource waste that results from inappropriate software selection and give you tools to see through "sales fluff" to find software that really meets your needs.